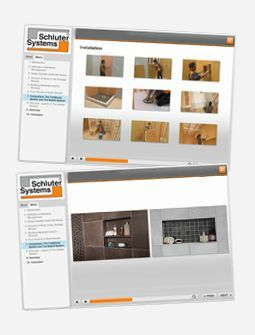 How long do I have to wait before I can install tile on Schluter®-KERDI-BOARD? For most installations of KERDI-BOARD, tile can be installed right away. Exceptions include curved wall areas and non-bearing partition wall systems. In these applications, the tiles can be installed once the bonding materials have cured sufficiently to stabilize the KERDI-BOARD assembly. In shower applications, a water test may be performed before setting tile to verify a successful waterproofing installation. This evaluation may be required by building code officials and is considered best practice. Wait 24 hours after the membrane (i.e., Schluter®-KERDI-BAND and Schluter®-KERDI) installation is complete to allow for the final set of the mortar and to ensure waterproof performance of the assembly at seams and connections before water testing.